The delay section is a stereo tempo-synced delay unit, with independent delay times for the left and right channels. One and Two set the time (in 16th ticks) for the two channels, FB determines the amount of feedback, and Gain the overall output level. LFO controls the speed of a beat-synced LFO, set to hard-left for a cycle time of 4 bars, and hard-right for a cycle time of a 16th tick. FM determines the amount of cutoff modulation via the LFO, whereas DM the amount of delay time modulation. Width controls the amount of stereo separation. Cut and Res define the cutoff frequency and resonance of a post-delay LP filter. Lo enables damping of pre-delay low frequencies. FX Mix cross-fades between the dry signal (pre XFX and delay) and the wet signal (post XFX and delay). When the Input button is enabled, the mod sequence determines the input level to the XFX and delay. Clicking on the meter below the input button toggles between proportional or binary (i.e. on/off) modulation. When Mix is enabled, mod is routed to the fx mix cross-fade position (as a proportion of the current fx mix knob position, i.e. if mod = 1 then fx mix will equal the actual fx mix knob position). Clicking on the meter below the input button toggles between proportional or binary (i.e. on/off) modulation. The EQ unit allows for boosting/attenuation of Hi, Mid and Lo frequencies. Set each knob to centre for no change. The >-< knob shifts the frequency of the 3 bands. Amp determines the amount of drive into a saturator distortion unit. Cut defines the cutoff frequency of a 12db lowpass filter. Trk determines the amount to which an envelope follower modulates the cutoff frequency, and Sm determines the smoothness of the envelope follower. The mod sequence can be routed to cutoff via the Mod knob. 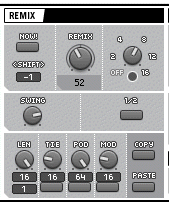 Magic features a notch filter and a granular-pitch shifter. ::: defines the notch filter cutoff, and the large slider at the bottom of the section controls the amount of pitch shifting (centre for no shifting). Gr sets the pitch-shifter grain size. Mod and Rmx define the amount to which the mod sequence and the pattern remix position modulate the pitch shifter respectively. Mix cross-fades between the dry and wet signals. 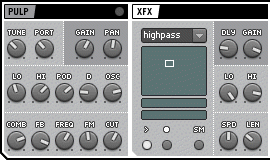 The XFX section contains a bank of 22 effects, and a recordable XY pad with which to automate the 2 parameters of each effect. Some of the 22 effects also have a non-automatable 3rd parameter, which can be set using the slider bar beneath the XY panel. Details of parameters for each effect can be found in Appendix 1. Press Play to enable automation playback, and while Rec is enabled, hold the mouse button and move the mouse to write to the automation sequence. The XY automation is stored in 2 x 64 data points, and Sm toggles between stepped or smoothed interpolation between each point. Spd determines automation speed and Len automation length. When Spd is centred and Len is set to hard-right, the automation length will last for exactly 4 times the kick/snare/hat sequence length. Dly defines the input signal into the XFX section. At hard-left, the input signal comes direct from the Samplers + Pulp unit. At hard-right, the input signal is the Delay unit output. When Dly is centred, the XFX input is a 50/50 mix of the two. Correspondingly, the Dly knob also determines the amount to which the delay section output is sent to the Mix (fx mixer) section. At hard-left, both xfx and delay output are sent to the fx mixer, but at hard-right, only the xfx output is sent to the mix. Thus, in other words, the Dly knob also cross-fades between xfx+delay parallel mixing and dly>xfx serial mixing. Lo and hi can be used to attenuate low and hi frequency elements of the xfx output. Set both to hard-right for no attenuation. Gain determines the overall output level. Port determines portamento speed, and A defines envelope attack time. FM sets frequency modulation depth, and MP defines the pitch of the FM modulator oscillator. The sample can be mixed with white noise using the Noise knob. The Vel (velocity) menu selects the modulation destination for velocity. Velocity can be routed to amplitude by adjusting the V>A knob (hard-left modulation, hard-right for full modulation). Zap controls FM depth, but unlike the Tie, the FM source is not an oscillator but a decay envelope. Pulp is a signal generator that transforms the input signal (selectable by the central knob) into a percussive-type output. First the pitch and amplitude of the incoming signal are detected. The pitch range is clipped with the Lo and Hi knobs, transposed by Tune and slewed by Port. Amplitude is detected by a peak detector, controllable by the D (decay) knob. The detected pitch is then routed to a sine oscillator and the filter cutoff of a noise generator. The Osc knob fades between the sine oscillator (hard-left), the input signal (centre) and the noise generator (hard-right). Finally, the output is fed into a comb filter. FB determines the amount of feedback, Freq determines the delay time, FM the delay time modulation amount (signal amplitude being the modulation source), and Cut defines the lowpass cutoff of the comb filter. Comb cross-fades between oscillator output (hard-left) and the comb filter output (hard-right). Several controls are common to all samplers:Gain and Pan determine mix volume and panning respectively. Acc determines the range between lo and hi accented hits. Higher values result in greater differentiation. While the Solo buttons deactivates other samplers for solo auditioning, each sampler can also be muted individually by clicking on the section label. Wav selects the sample (each sampler has 128 samples) and Tune defines pitch transposition. Cut and Res define filter cutoff and resonance respectively. Select the filter type with the LP / BP / HP knobs (for low-pass, band-pass and high-pass respectively). The Kick and Snare share identical controls, with the exception of the filters. The kick has a lowpass filter and an optional low cut button to remove low frequencies. The Snare features a filter which can operate in either lowpass, bandpass or highpass mode (the knob next to cut selects which mode). St defines sample start position; H and D determine the hold and release time of the envelope respectively. Sat determines the amount of saturation distortion, and the Shp knob controls a sound shaper that can either ‘thin’ (left) or ‘fatten’ (right) samples. Sm controls the amount of smoothing (effectively the attack and release time of gain changes). High settings produce less undesirable artefacts at the expense of decreased sound shaping. Mod routes the mod sequence to one of several parameters in the section – Wav (wav selection), P (pitch), D (decay time), or Cut (filter cutoff). The Snare mod menu also includes an entry for Flam time. The Hat unit contains 2 samplers, one for open and one for closed hat samples. Thus, there are 2 decay times -CD (closed decay) and OD (open decay). When Link is enabled, the 2 samplers operate monophonically, in that triggering one will terminate the other – thus emulating a real hi-hat on an acoustic drum kit. The Mod menu is the same as with Kick and Snare. 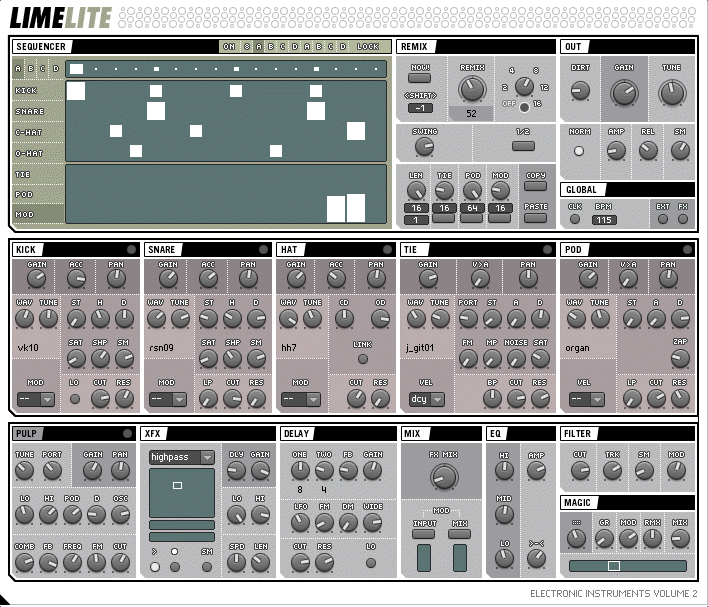 The controls in this section influence the overall master output of Limelite. Gain controls master volume, and Pitch defines global tuning (+/-12 semitones). Dirt controls a distortion algorithm, while Norm enables a volume maximising algorithm. For the volume maximiser, Amp defines the maximum amount of volume maximisation, Rel determines the release time of a peak detector and Sm determines the amount of slew (the speed) of shifts in gain. Loud, but harsh sounds will be obtained with high gain (full-right) and fast Rel and Sm settings (hard-left). Better results will usually be obtained with more modest settings. Ext allows external input to be fed into the Pulp unit and FX processors. Note that external input is always routed to Pulp if Pulp input is set to Ext, regardless of the global Ext button. 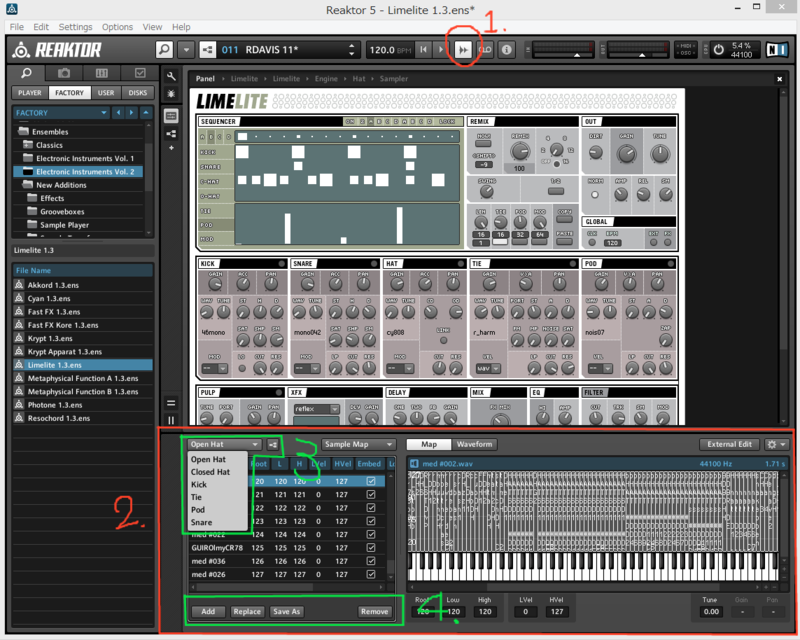 The FX switch disables the samplers, so that Limelite can be used solely as an FX unit, with lower CPU demand. Note that the FX switch overrides the Ext switch setting – in that external input will always be enabled. Typically drummers repeat a basic sequence with a variation on the th or 8th bar, for example. The remix sections allow this style of play to be emulated without the need for manually programming the variation pattern. The Remix knob selects a pattern from the 127 pre-programmed variations. The rate of the variation pattern (i.e. every other bar, every 4th bar, every 8th bar etc) can then be set with the remix frequency knob (top-right). When the Now! button is enabled, the remix frequency knob is overridden, and the remixed pattern will play continuously. This is especially useful for when browsing through the 127 patterns with the Remix knob. <Shift> varies the remix pattern in one of two ways. Positive values shift the output position of the remix patterns, whereas negative values shift the start position of the remix patterns. Thus, bearing in mind that all remix patterns are 16 steps in length, consider the example of pattern one (1,2,3,4,5,6,7,8,9,10,1,2,3,4,5,6). A shift value of 1 will increment all steps (resulting in 2,3,4,5,6,7,8,9,10,11,2,3,4,5,6,7). A shift value of -1 will rotate all steps, so that step 16 is rotated back to the first step, (resulting in 6,1,2,3,4,5,6,7,8,9,10,1,2,3,4,5). Swing determines the extent to which a humanizing, shuffling algorithm is imposed onto the beat. The algorithm effectively swings time forwards and back again on alternating steps. The 1 / 2 button halves the tempo (e.g. 120 becomes 60). The Tie, Pod and Mod sequences can be edited in the lower window. To select which of the 3 sequences to edit, click on the label to the left of the window. To reset a sequence, click on the label while simultaneously pressing any MIDI note. Note that unlike the Tie and Mod sequences, the Pod sequence is bi-polar. Both negative and positive values can be entered, for +/- pitch transposition for example. When editing the pod sequence, double-clicking the mouse results in a centre (zero) value. This will trigger the sample but yield no velocity modulation. Note that the Tie, Pod and Mod sequences are independent of the main sequence. While the main sequence has 4 patterns, which can be freely arranged, the Tie/Pod/Mod sequences loop continuously and independently of the A/B/C/D pattern sequencer. 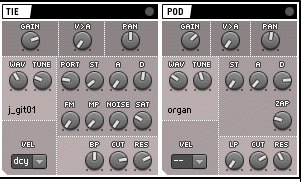 This remix section contains a variety of patterns for defining and rearranging the main and Tie/Pod/Mod sequencers. The length of the main pattern, and the Tie/Pod/Mod patterns can be set using the controls at the bottom of the section (labelled Len, Tie, Pod and Mod). The start position can be edited with the value beneath the Len knob. The 3 buttons beneath the Tie, Pod and Mod length knobs stretch the Tie/Pod/Mod sequences to fit the length of the main sequence. So for example, if the main sequence is 16 steps long, and the Pod sequence is 32 steps with stretch is enabled, the Pod sequence will run twice as fast as the main sequence. Similarly, if Pod length is 8, it would run at half the speed of the main sequence. 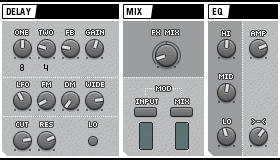 The main sequencer window has 4 patterns – A, B, C and D.
When Track is enabled, the main window will always follow and display the current pattern (A, B, C or D) being played. To select which to edit, click on the desired pattern in the top-left of the sequencer area. 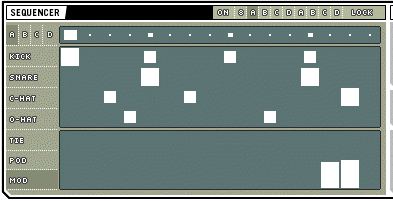 Patterns A, B, C and D can be arranged in any order by using the pattern sequencer, (at the top-right of the sequencer section). Enable the pattern sequencer by clicking on the on/off button, and click and drag on the adjacent number to set the sequence length, (2 to 8 bars). Finally, click and drag on the 8 pattern letters to define the pattern arrangement. The Copy and Paste buttons allow any of the 4 patterns to be copied and pasted, either within or between snapshots. To clear the current pattern, click Paste while simultaneously holding a MIDI note. Copyright © とっとね～みんはふはふはんの音楽部屋 All Rights Reserved.